Quality of Service (QoS) management has attracted a lot of research interests in the last decade, mainly in the fields of telecommunication networks and multimedia systems. With the recent advance in e-commerce deployment, it clearly appears that today’s web applications will require the integration of QoS mechanisms to specify, declare and support the different service levels they can provide. Such mechanisms should therefore be integrated in the different components of the core technology and more specifically in database systems. In this paper, we present an approach to push QoS inside database systems. 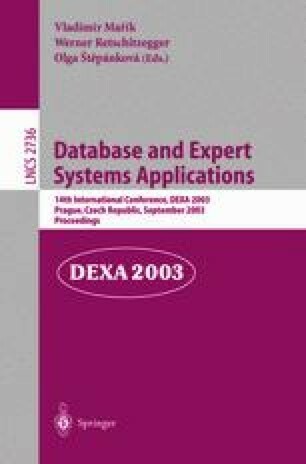 This approach integrates QoS requirements into distributed query processing and considers also the dynamic properties of the system. We propose a query optimization strategy where multiple goals may be considered with separate cost models. This work was supported by a grant from the Canadian Institute for Telecommunication Research (CITR), under the Network of Center for Excellence Program of the Canadian Government, a collaborative research and development grant from NSERC No. CRD-226962-99, by a student fellowship from IBM and an individual research grant from NSERC No. RGPIN138210.